Many urban sketchers out there are packing their gear for Chicago as we speak. It seems like a tradition to post a “what’s in my bag” article. Lately I’ve been carrying around a beach bag style shoulder bag. Which has been nice, as it’s super simple to find things. But somehow, my lifestyle lately has been going downhill. I’m getting old, fat and tired! Things have been a little crazy, and fitness went off the list for a while. Big plans for a re-boot very soon. Upshot is, I’ve been getting a sore shoulder from a one-armed bag. (Probably more from my digital art tablet at home, not my limited time out sketching). But I figured I’d switch to a backpack for a while. 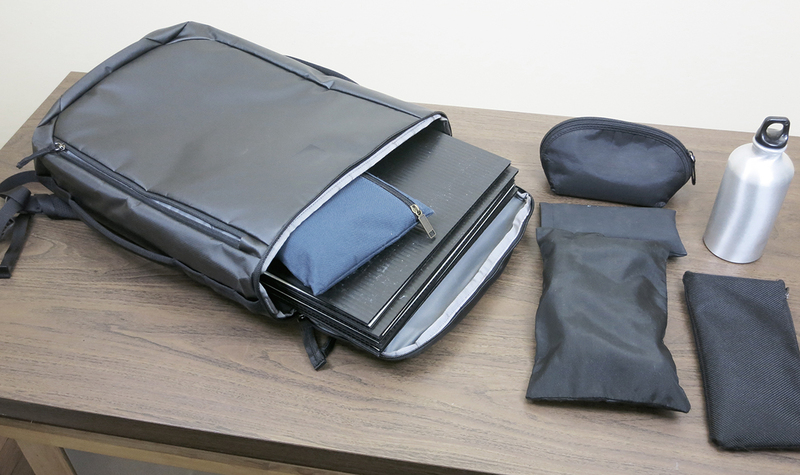 In the real world, people are carrying around larger laptops and tablets these days – so the bag makers have started coming out with these square backpacks. I saw this one and I thought: perfect for drawing boards! 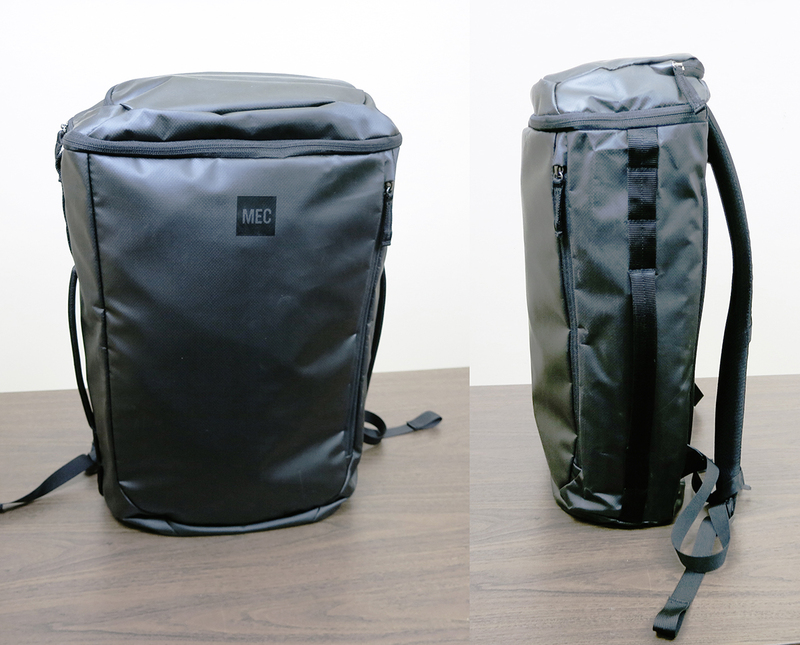 This is my ‘fully loaded’ MEC Outpost Daypack. I don’t know the final weight here, but it’s mostly air inside – (coroplast groves, etc) – so under 2lb’s for sure. It’s the exact size for 12×16″ drawing boards, which is the minimum for 11×15″ quarter sheets of watercolor, given some room to tape them down. 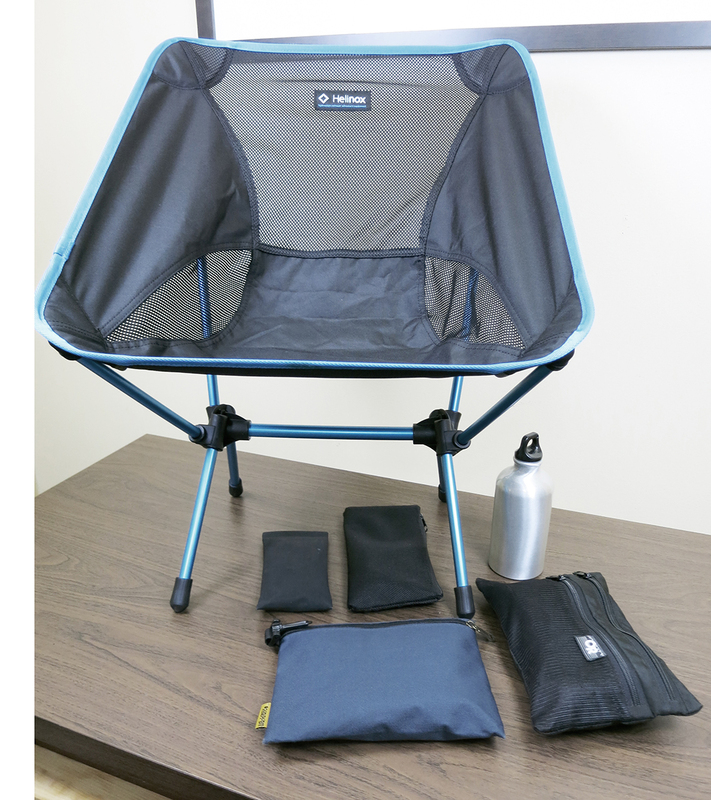 I’ve got 10 panels in here, and all my various other gear, including the most comfortable folding chair I’ve ever tried. This is the Helinox Chair One. I was sketching with Jane Blundell and it got the thumbs up from her. I agree it’s a great option. It’s a little slow to unfold and setup, but it’s ‘hella comfortable. Like a la-z-boy for sketchers. I’ve started carrying it around like a weird umbrella once I’ve bothered to sling it together. A bit odd looking yes – but it’s essentially weightless. So that’s an option for someone who re-locates many times in a sketching session. The other reason I went for this bag is the little zipper compartment on top. This is probably for your phone or passport or whatever (as it’s theoretically a back-facing security zipper), but it’s perfect for my paint box – as it keeps it horizontal, in it’s own compartment, resting securely on top of the sandwich of drawing boards. This way, no matter how fresh and juicy the paints, they won’t leak between the pans. Usually I have the paint box on the very bottom, being held horizontal by all my gear – but that means you can’t get it out without dumping the stack, which is less than ideal. So, I’ll report back after I get a few more days of testing this setup – but one way or another, this is what I’m taking on the road this summer. Feel free to post if you’ve got your own ‘Everyday Carry’ photos up online. Oh and, here’s some previous years when I carried a tripod easel, brought an ultra-small pen and ink kit, and a bag that’s good for larger panels. ← Get ready for USK: Chicago with #OneWeek100PeopleSymposium! Love it. I especially like the chair and will check it out. Thanks for posting.. I have built a sketch panel out of coroplast and I can add a Portable Painter palette, three brushes ( they sit in punched holes) and a Hahnemuele 6×8 sketchbook…I will show it to you at your workshop on Thurs, July 27! Marc, no easel and tripod??? See you and Laurel soon! I love my comfy Helinox chair too. Am bringing it to 8/5 gathering in Montreal. I admire your work so much! Love seeing this stuff. MEC is a great place to get things like this. My EDC fits into a back pack and be can be see here: http://gurneyjourney.blogspot.ca/2017/06/your-new-easel-builds.html. I need the tripod due to RSI but am working on some alternatives. On my Instagram page I posted a method for keeping watercolour pans from leaking in a small metal watercolour box: instagram.com/glenn_workshops. Thankyou for all of this information about your kit and that wonderful chair. The kit needs just one more thing, keeping in mind your plans to work on your fitness: maps of the surrounding area where you plan to paint. Leave the motorised transport a few kilometres before your destination and walk. Oh yes, a pedometer comes in handy too. These things don’t weigh much. And as one loses weight there is less to carry around (I need a smiley here). And the exercise puts a spark into the brain cells. Am I going on too much here about the benefits of walking? Thanks for your blog Marc. Have fun in Chicago. Thank you for your blog which I always enjoy. In jest – if you can get Liz Steel to use one I may do so also. But please be careful, with the extra fine and pointed legs the chair is not safe to use on soft ground as they sink to an awful angle tossing the “rider” on his/her back with legs in the air. Very unprofessional. 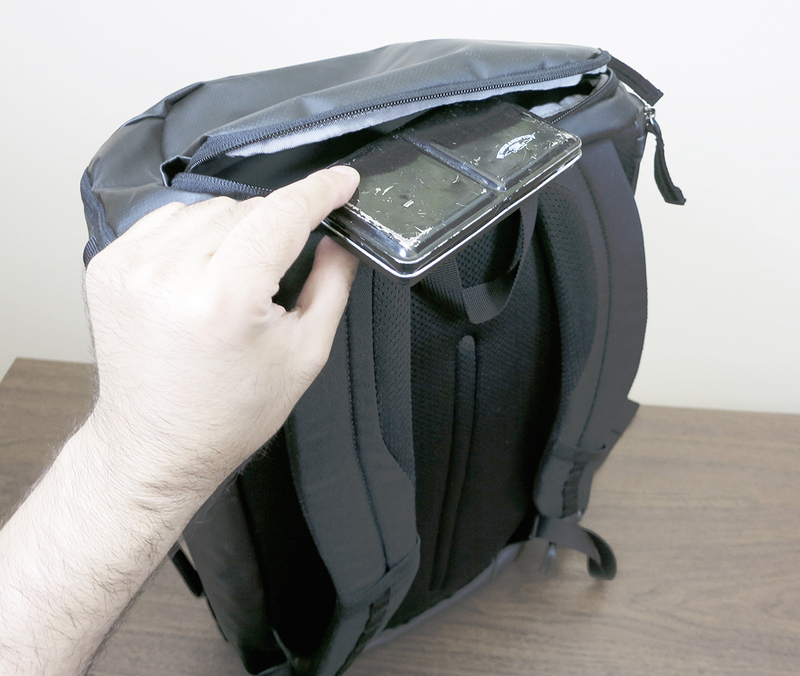 The new bag looks like a good solution for a sore shoulder. And that chair, I’m going to test-drive it when I see you. But wait, no “what are those colors in your palette?” comments? see you soon! Can someone tell me where to buy the coroplast, just a couple pieces. Thanks. They carry cut pieces at my local art stores, or huge sheets at a hardware store which you can have cut down usually for a small fee. Also, places that make signs often have it. I like my army surplus bag, it has lots of pockets and even several skinny ones perfect for pens, pencils, travel brushes and water brushes. I carry a tiny stool with a shoulder strap. Fine for a beginner like me. Love my big Timbuk2. I can slide my laptop in it, or drawing stuff, or my charkha, or my knitting. It is all I carry and I have a couple of different color combos so I can change them by the season, and they’re vegan. I have a similar style metal travel palette to you and it stains badly – I wonder what you (or anyone who has a similar palette) use to clean your palette without taking the white enamel surface off? Love your work, your style and your color choices! Well, I just use it dirty myself – but I’ve been told those “Magic Erasers” work. I’ve been feeling the same way about my shoulder bag but have always disliked the geometry of the standard backpack that pulls away from your back as it gets larger at the bottom than the top. This one looks ideal. I’ve had the Helinox chair on my to buy list for a while. Guess I need to make a trip to MEC. Thanks, Marc. First, Marc I love your blog. Thank you for the work that is involved. I really appreciate all the tips and following your travels. Marvelous fun. Anyway, on the kit. I suppose I’m a minimalist. I too became tired of carrying a one shoulder bag into the field. But I may have swung over to the left a bit. I now carry a small tummy pack, which takes me on my many hikes. 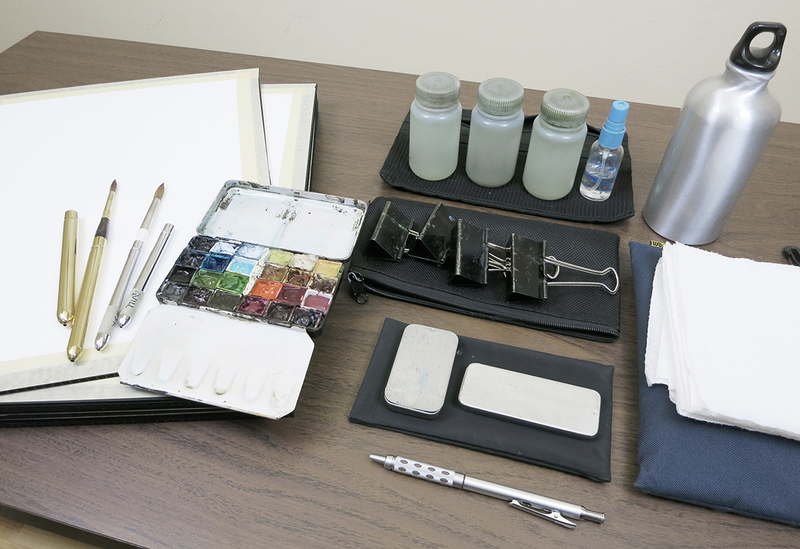 The pack contains a small watercolor palette, mechanical pencil, fountain pen, eraser, paper towels, a medicine bottle repurposed to carry water, a spray bottle – small of course and two water color travel brushes. Oh, and a small 4 x 6 journal which fits perfectly in the pack. If I wanted to do a larger painting I could carry a board separately. But this summer season I’m enjoying the heck out of just going light. So much fun. And a wonderful record of my summer season. Probably wouldn’t work for you, but no more shoulder pain! Stephanie from Lincoln City, Oregon and Tucson AZ in the USA. I’ve been looking at seating options. I find that chair way to expensive. My current solution is a $10 tripod. I get all stiff and sore when I’ve been sitting on it for an hour, so I will eventually need something better (in a lower price range!). In your search did you try the WALKSTOOL COMFORT 55XL? I’ve been eying it for a while but haven’t had a chance to see one yet. I have tried a walk stool, they’re quite nice. (The extra height is comfortable, especially with an easel). but I’ve decided now at age 50 I like the back support of this new Helinox chair. Also, with just a drawing board on my lap, it’s nice to be ‘knee height’ – if I cross my knee, it’s perfect to support the board. Thanks, I just turned 54 so I know what you mean. I tend to work at an easel but will look at both chairs next time I’m at MEC. Enjoy Chicago! Hey Marc,great being in your workshops! I was wondering what brush that was you were using with the hourglass shaped handle? You are a very good teacher. Was great to meet you – and thanks for the “ink scraper” or whatever you call it :) What a great addition to KK’s twig-style. And those brushes are the Windsor and Newton pointed round sables.